It is interesting how life makes a full circle. Today is National Day of Service in honor of Dr. Martin Luther King, Jr. and President Barack Obama’s Second Inauguration. For some, it is simply a day dedicated to volunteer work and giving back to their community. But for others, it is a deeply personal. “I used to be a customer here,” Terry Doherty told WEBN at the Helping Hands Food Pantry. Doherty had used the pantry when he was out of work and struggling. Today, he is assistant manager at Helping Hands and says he returned to give others the same help he received. come here because they know they will never be turned away. 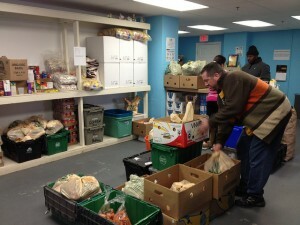 In addition, Helping Hands delivers food to customers who are physically unable to obtain it themselves. This assistance provided by Helping Hands will certainly not end anytime soon. Volunteers say it is much needed not only during the current economic crisis, but also all the time.”I think there should be more food pantries out there,” says volunteer Clayton Haywood.